Old-fashioned fragrant rose, perfect for making rose water. Photo: Elizabeth Urbach. Now that we’re into the warmer spring weather here in San Jose, local rose bushes are blooming and scenting the air with their fragrance. 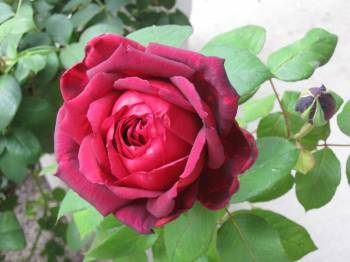 Roses not only smell wonderful, but are edible, when grown without chemical fertilizers and pesticides. If you have access to food-grade fresh or dried roses, you can use them for both culinary and medicinal purposes — they are soothing and moisturizing — and some rose recipes are good additions to the tea party pantry! Some of the most useful rose-scented treats include rose water and rose jelly. 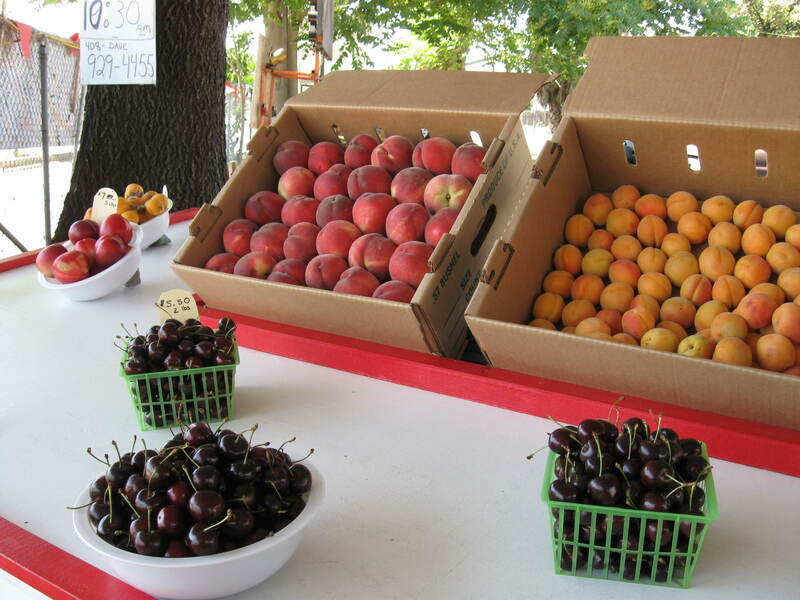 San Jose’s history as “The Valley of Heart’s Delight” is no longer visible in the orchards that once covered the Santa Clara Valley, but plenty of local people still have fruit trees in their front and back yards, trees that are filling with ripe fruit this season. Wild plums and berries can also be found along the banks of rivers, creeks and streams in the Santa Cruz mountains and local foothills. For those that don’t have edible landscaping at home, and even for those that do, the local farmers’ markets are a wonderful source of fresh, ripe fruit for tea-table jams and preserves. What better treat to serve your tea guests, give as gifts, or enjoy by yourself than homemade jam? You can make jam either with or without adding pectin; it’s a fairly easy recipe either way. Have a tea brunch while you watch the 2013 Rose Parade! The Tournament of Roses, or as it’s known locally, the Rose Parade or the Rose Bowl Parade, begins at 8 a.m. on January 1st and will be broadcast on ABC, Hallmark Channel, HGTV, KTLA (Tribune), NBC, RFD-TV and Univision. It is a New Year’s Day tradition in California to watch the event in your pajamas with a hot drink and a plate of food. Why not extend your New Year celebrations with a brunch while you watch the Rose Parade? Include any leftover champagne, and check your tea party pantry for usable items, as well. Anything tasty and easy will do. The parade theme for 2013 is “Oh, the Places You’ll Go”, so whimsical Dr. Seuss-style foods like Green Eggs and Ham can make an appearance at this brunch. Of course, rose-flavored and rose-scented items would also be appropriate; rose-flavored Turkish Delight can sometimes be found in the Middle Eastern food section of local supermarkets like Nob Hill, and bottles of rose water are on the shelf even in Target’s food section. Add a teaspoon of rose water to a cup of hot black tea, and you will have a fragrant and delicious treat. If you have any last leftovers from Christmas dinner, or even New Year’s Eve party appetizers, pull them out and put them on the table, or make them into a new treat for your brunch buffet. Then settle down and watch San Jose’s Valley Christian HS East-West Fusion All-Star Band, who will be marching in the parade, and Stanford University, who will be playing the University of Wisconsin later that day. Happy New Year! Like what you read? Leave a comment below, click on “Subscribe” above, visit the San Jose Tea Examiner page on Facebook, read my other blog, The Cup That Cheers, or follow me on Twitter @SanJoseTea or Pinterest! Tea for studying in San Jose. Now that the first day of class at SJSU and local high schools has come and gone, keeping the energy up for studying regains its important position in life for local students. Many choose to drink coffee and energy drinks to stay awake, but these beverages can upset the digestive system as well as sleep patterns, so a pot of tea makes a really good alternative, being gentler on the body, while still providing a caffeine boost. However, different kinds of tea are better for studying with than others. One common tea myth states that black tea has the most caffeine, and green and white tea have the least amounts of caffeine. That’s incorrect; each type of tea – black, oolong, green and white – falls within a range of caffeine content, and the range for each type of tea overlaps with at least one other type. For example, it is possible to find a white tea that contains more caffeine than a particular black tea! However, white teas are so delicate in flavor and aroma that they should really be appreciated when you have nothing more serious to do than relax. For studying, or any prolonged intellectual work, like reading, or manual work where you need a steady hand, like working on your car, a black, oolong, or green tea will provide enough flavor to keep your taste buds satisfied, but not make you jumpy like coffee can. If you prefer black tea, choose a tea from India, especially Assam, as that variety has been bred over the years to have a higher caffeine content, and it is especially good if you add milk and/or sugar. A dark or amber oolong – which has a more robust and less floral flavor – is nice study companion, and a good-quality Chinese green tea can also be a great choice. 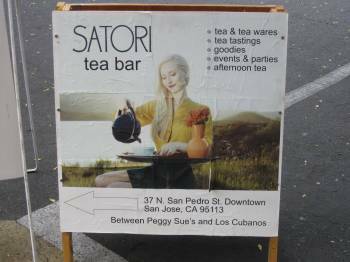 You can get flavored and unflavored black, oolong and green teas at local tea shops like Satori Tea Bar in San Pedro Square, and even some coffee shops, like Peet’s Coffee & Tea. If you aren’t used to the taste of tea, or if you are a coffee-drinker trying to cut down on coffee, then masala chai – Indian tea with milk, sugar and spices – is a good choice for both flavor and caffeine content. You can get chai from Starbucks and Peet’s, and find chai concentrate and powdered chai mix at most Safeway, Lucky, Nob Hill, and Save Mart grocery stores if you don’t want to (or can’t) make it from scratch. Pull some packaged cookies or some chocolate from the tea party pantry to munch, and you’ll be set for a productive study session. However you drink it, tea is a great beverage to study with, keeping you alert, but not jumpy, providing great flavor and hydration, plus keeping San Jose’s students warm during these cool, windy autumn days. Like what you read? Leave a comment below, click on “Subscribe” above, visit the San Jose Tea Examiner page on Facebook, read The Cup That Cheers, or follow me on Twitter @SanJoseTea! 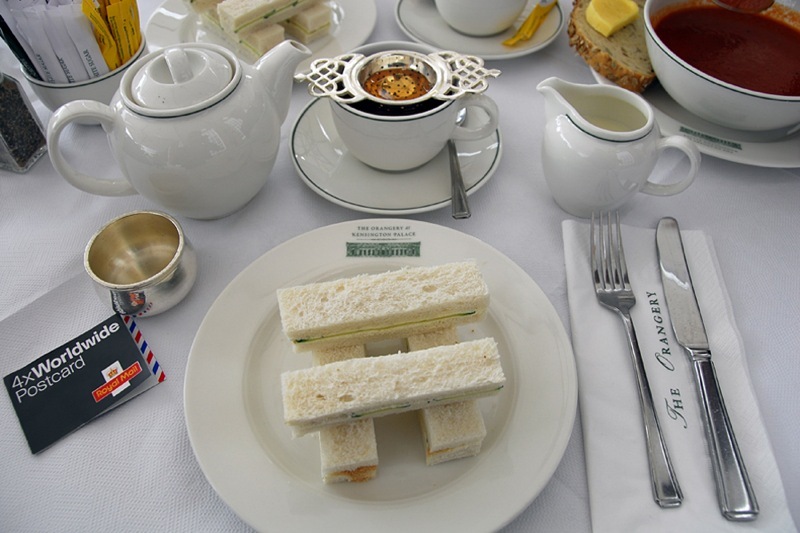 What is proper tea etiquette? A perfectly set, formal afternoon tea place setting, at Kensington Palace. Image: Bit Boy, Wikimedia Commons. Do offer to pour the cups of tea for your friend or friends. Add milk to your tea, if you like, but not cream. Cream is too rich and covers up the flavor of the tea. It doesn’t matter whether the milk or the tea goes into your cup first. Do use the utensils like sugar tongs, lemon forks or serving spoons, to serve yourself or others from shared containers, instead of your fingers or your personal teaspoon or fork. Remember to include these items when stocking your tea party pantry! When serving yourself some jam or other scone toppings, use the serving spoon or knife to place a small amount on the side of your plate, and then use your personal spoon or knife to spread your jam, cream, etc. on your scone. When eating your scone, break the scone in half, and only spread one bite-sized section at a time, with the toppings, instead of the entire half-scone. It helps keep jam, cream, etc. off your face as you’re eating! Do try to make as little noise as possible when stirring your tea, drinking your tea, or eating your food. Do place your spoon on your saucer after stirring your tea, instead of on your plate or on the tablecloth. Do hold your teacup by the handle, either pinching it in between your thumb and first finger, or putting your finger through the handle and supporting the cup with your thumb on top of the handle and your third finger under the handle. Don’t stick your pinky up or out when holding your cup of tea. It is an affectation which is more prissy than polite, plus it compromises your grasp on the teacup’s handle, which is unsafe. Don’t turn your teacup upside down on your saucer to indicate when you’ve had enough tea; you will drip tea on the tablecloth! Teatime is about relaxation, being considerate, and comforting others as you enjoy the comfort of the tea and treats. That’s not so hard to do! There are many tea books on the market, including etiquette guidebooks, that can give you more detailed pointers if you want them. 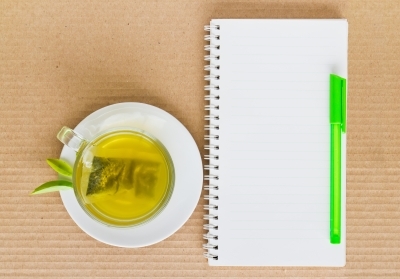 Why not practice good manners over a cup of tea? Lisa's Tea Treasures at the Pruneyard in Campbell. Photo: Elizabeth Urbach. 1. Children’s Holiday Princess Tea: Wednesday, December 14th, 4-5:30pm, at Lisa’s Tea Treasures at Santana Row. Featuring the Holiday Princess, this is an event intended for children ages 5 to 10 years old. There will be a magic show, music, a holiday story, and other entertainment along with a child-friendly tea menu. $31.95 per person plus tax and gratuity. Reservations required. 2. Sugar Plum Teas: Wednesday, December 14, 4:30 p.m. at Lisa’s Tea Treasures at the Pruneyard. Children ages 5 -10 take tea with the proprietress Dale Ann, decorate Christmas cupcakes and enjoy special entertainment by the Holiday Fairy! $29.95 per person. Reservations required. 3. 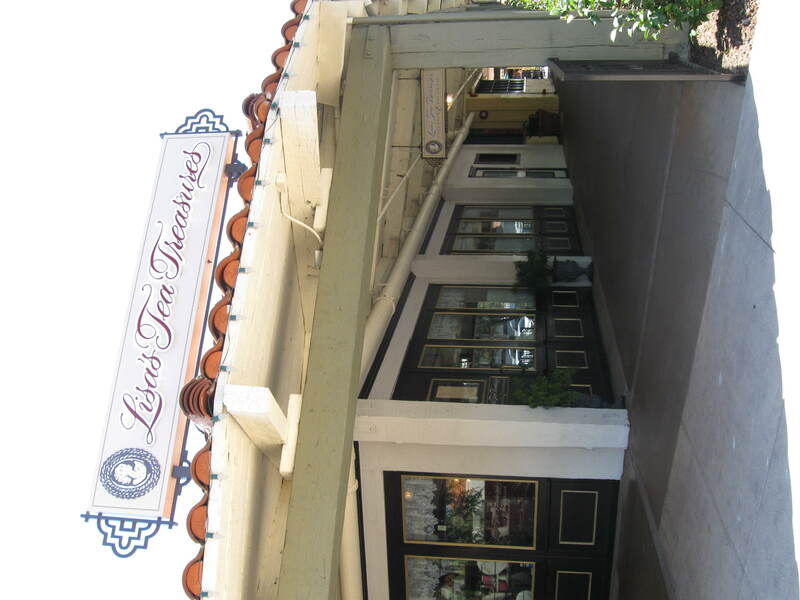 Holiday Candlelight Teas: Thursday, December 15th, 6 p.m., 6:15 p.m. or 6:30 p.m. at Lisa’s Tea Treasures at Santana Row. This event features a hearty High Tea menu, with the addition of soup and a glass of champagne. $31.95 per person plus tax and gratuity. Reservations required. 4. Victorian Noel Gala: Friday December 16, 7 p.m., 7:15 p.m. and 7:30 p.m. at Lisa’s Tea Treasures at the Pruneyard. This elegant event features champagne, candlelight, music and a 5 course dinner (soup, salad, sorbet, entree with side dishes and dessert). $44.95 per person. Reservations required. 5. Spirit of Christmas Tea: November 25, 2011 through January 2, 2012 at Lisa’s Tea Treasures at the Pruneyard. Featuring: Spiced Plum tea, cinnamon scones, hearty soup and savories, and decadent desserts. $29.95 per person. Reservations required. 6. Tea in the Lobby Lounge: Monday through Friday, 1 p.m. to 4 p.m., and Saturday and Sunday, 1 p.m. and 3 p.m. at the Fairmont Hotel downtown San Jose. $18 (children), $32 (standard menu) or $42 (Royal tea) per person, plus tax and tip. The perfect thing to do before visiting Christmas in the Park across the street! Like what you read? Leave a comment below, click on “Subscribe” above, visit the San Jose Tea Examiner page on Facebook, read my blog, or follow me on Twitter @SanJoseTea! San Jose joins the rest of California in celebrating an important milestone: the centennial anniversary of women being granted the vote in California! In 1911 the Women’s Suffrage Amendment was finally passed by both houses of the California Legislature, and it was signed into law near midnight on October 10, 1911 by the governor, under the eye of Clara Foltz, the first female lawyer on the Pacific coast of North America, who lived and practiced in San Jose. The struggle for women’s voting rights officially began at a tea party. In 1840, Elizabeth Cady Stanton and Lucretia Mott, along with other female American delegates to the World Anti-Slavery Convention in London, were not allowed to sit in the convention hall with the other delegates, or participate, because they were women. They realized the many similarities between the conditions of racial slavery and gender inequality, and resolved to address the issue on their return to the U.S. In July of 1848, New York passed legislation giving married women some property-owning rights. Stanton, who lived in Seneca Falls, New York, met Mott at a tea party she attended, and the women discussed their political situation over tea and refreshments. Less than a week later, Stanton and Mott called the first Woman’s Rights Convention in a church in Seneca Falls, where the 300 attendees (including 40 men) discussed “the social, civil, and religious condition and rights of woman.” They also adopted 11 resolutions,including one calling for full voting rights for women. Stanton wrote, “To have drunkards, idiots, horse racing rum-selling rowdies, ignorant foreigners, and silly boys fully recognized, while we ourselves are thrust out from all the rights that belong to citizens, is too grossly insulting to be longer quietly submitted to. The right is ours. We must have it.” The media, except for Frederick Douglass’ newspaper, responded with ridicule to the meeting and the issues discussed there, but there was no going back. The issue had been raised and would not be allowed to rest. 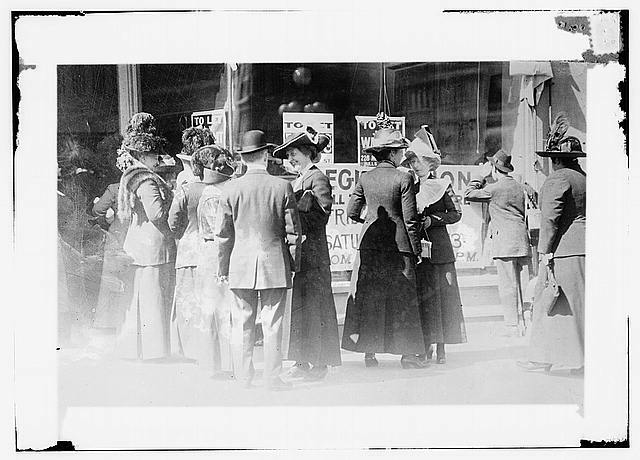 Women registering to vote in San Francisco, 1911. Library of Congress. Throughout the 19th century and into the 20th, many women (and men) worked tirelessly to promote the idea of women having the same rights as men, and to secure those rights and opportunities step by step: from the right to higher education, to the right to work in “male” occupations, to the right own property, and the right to be on school boards and vote in minor local elections, to the ultimate goal of complete voting rights as full citizens of the United States. Many other reform groups like the WCTU, as well as churches and synagogues, joined the work, giving speeches, writing supportive articles and essays, and giving money and other valuable goods and services to the effort. Several of the Western states started giving women full voting rights, starting with Wyoming in 1869; California followed as the 6th state to grant women the vote, in 1911. 72 years of constant work and education, struggling against negative attitudes in wider American society which were spurred on by the media through propaganda and destructive editorials, finally resulted in the 19th Amendment to the U.S. Constitution, which extended voting rights to all American women in 1920. 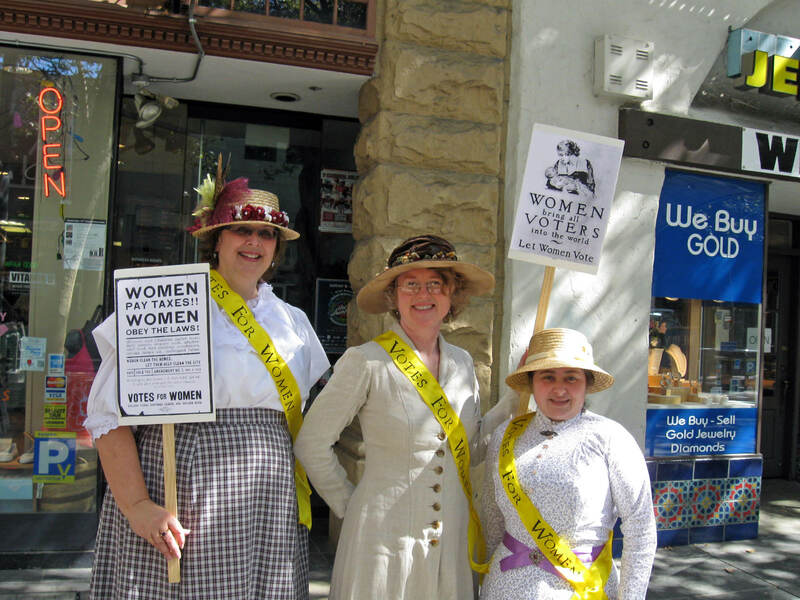 21st century San Jose women — members and friends of the South Bay Ladies’ Tea Guild — celebrated the centennial anniversary of this successful effort by meeting at the Knox-Goodrich Building, a ca. 1889 sandstone built for and owned by Sarah Knox-Goodrich, the founder of San Jose’s branch of the Woman Suffrage Association and a champion of women’s rights in California. They then “marched” to San Pedro Square where they gathered at Satori Tea Bar to discuss the history of the movement and the accomplishments of the remarkable women who participated. They garnered quite a bit of attention and were able to celebrate this momentous event in appropriate style! Turbo Tea Party at San Jose’s Satori Tea Bar! Satori Tea Bar sign. Photo: Elizabeth Urbach. Save this evening for a fun event: the Turbo Tea Party at Satori Tea Bar in San Jose! Satori Tea Company is pairing with Outpost Collective for an art and music-filled party, filled with the whimsy of Alice & Wonderland’s “Through the Looking Glass.” The event will run from 5 to 9 p.m. at Satori Tea Bar in San Pedro Square. There will be live music, a live artist, and plenty of opportunity for you to bring your own paints and create some art as well. Admission is FREE! Tea and sandwiches are only $5, so this promises to be a fun event that everyone can afford! Satori Tea Company is San Jose’s newest tea shop. Victoria Boyert, the shop’s owner, celebrated Satori Tea Company’s first birthday recently. Why not go down and see the tea blends she’s carrying, and check out the new Fall afternoon tea menu for the coming season? 37 N. San Pedro St.
Is it beer, or is it tea? 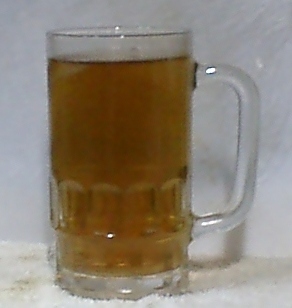 Mugicha, or barley tea. Wikimedia Commons. We all think of beer when planning our Labor Day menu, but tea? Why not? There are plenty of teas that pair perfectly with barbecued meat and vegetables, and beer fans can enjoy them too. Choose some tea to serve alongside the beer at the beverage table: don’t be intimidated! Tea doesn’t have to be all flowery and girly: after all, one of the 5 new trends in tea is emphasizing tea’s appeal to men! Think about beer’s most basic ingredients: malt, hops, yeast and water. These combine to produce the characteristic flavors of beer: malty toastiness, caramel-like sweetness, nuttiness, chocolate nuances, bitterness, citrus-like fruityness, and savory, robust flavor. Guess what? Those flavors exist in tea! First on the list of recommended teas for American beer-drinkers, should be the teas that have historically been popular in places where both tea and beer are widely consumed by the same people, like the U.K. and Canada. Assam tea, which is known for a malty flavor, is always part of English and Irish Breakfast tea blends, might also appeal to a fan of American lagers, like Miller. Keemun is another black tea that is part of English and Irish Breakfast blends, and is known for wine-like and fruity nuances. If you tend to like bitter beers, then you might prefer a Darjeeling tea, since it is characterized by a pleasant astringency or bitterness. If you like to eat a lot of greasy fried foods with your beer, then a Pu-erh tea might be better for you, since it is supposed to wash the fat from your food out of your digestive system. Then there’s gunpowder green tea, which is both tasty and has “gun” in its name; what’s not to like? Japanese mugicha, or roasted barley tea, is a tisane which might appeal because of its similar flavor profile to some lighter beers, which includes nutty, toasted grain and slightly sweet elements. Lastly, if you like a dark ale that features a roasted flavor, you might like a green tea like hojicha, which is roasted over coals, or genmaicha, which contains toasted rice grains. Since tea and beer feature some similar flavors, it has occured to some people to mix the two! Some people put fruity teas into their beer (maybe a lime- or lemon-flavored tea? ), and some people buy their beer with tea already in it — there are new products called “Chai Cream Ale” and “green tea beer” that just entered the specialty beverage market, and might be at some South Bay BevMo stores. So, whether you’re celebrating Cinco de Mayo, Dia de los Muertos, or Labor Day in San Jose, tea is a great addition to the menu. Haagen-Dazs Sweet Chai Latte ice cream. Photo: Elizabeth Urbach. Chai, a sweetened, milky spiced tea based on Indian masala chai, has become very popular in the San Jose area recently. Starbucks, Peet’s, and many other local coffee shops have added it to their menus, and it rivals coffee in sales. You can order it hot or iced, and Safeway, Lucky, and Zanotto’s even offer liquid chai concentrate and powdered instant chai! It’s a very short step from iced chai to chai ice cream, but if you wanted that, up until this spring you had to make it yourself. 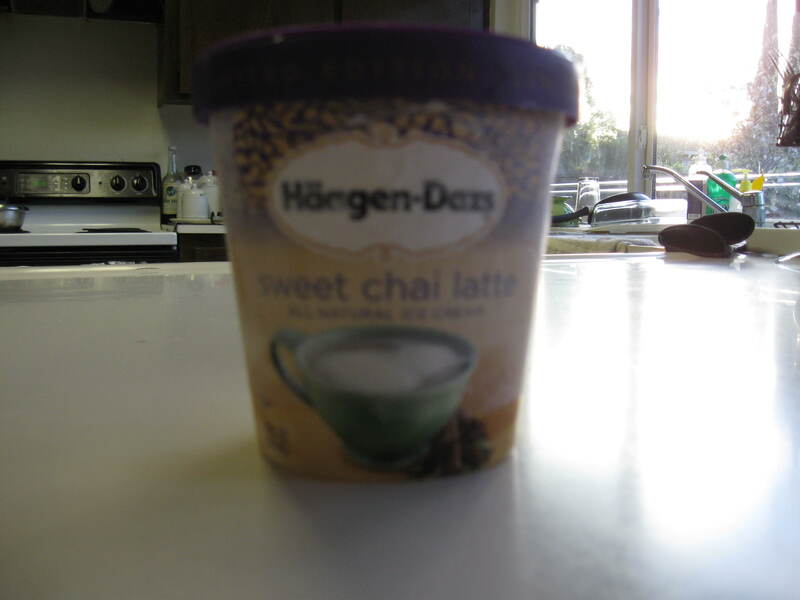 In February, Haagen-Dazs released a new Limited Edition flavor, Sweet Chai Latte, for 2011. It will be avilable at Safeway and other grocery stores throughout the San Jose area until September, according to the company website. It disturbed me a bit that the ingredients include “natural black tea flavor” as well as “tea”, and that mysterious combination of “spices.” I wonder what makes the “black tea flavor” so different from “tea”, and what “spices” are in there? I tasted cinnamon, nutmeg, ginger, and other flavors that would be in Christmas gingerbread, but I couldn’t really identify them separately. I did find the black tea flavor to be a little weaker than I would have liked, but the taste as a whole was very good, as was the lovely creamy texture that Haagen-Dazs is famous for. I would recommend this ice cream to anyone, and I would also recommend that people stock up on Sweet Chai Latte ice cream before it’s taken off the freezer shelves in September! I purchased this ice cream at Safeway in Milpitas. All text and images in these articles are the property of Elizabeth Urbach, except where noted. Please obtain written permission before using anything not labeled "public domain", "Creative Commons Attribution-ShareAlike 3.0 License" or "GNU Free Documentation License."